Chola Dynasty was one of the most powerful dynasties of south India. They ruled south India for a long time and united the whole south India. The main area they ruled was the valley of the Kaveri River. In the peak of their time, the empire was extedded to the whole south india, sri lanka, maldives, Malaysia, Indonesia and to ganges in the east. 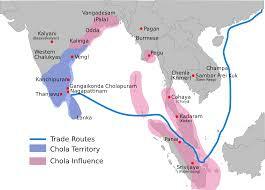 Chola dynasty is generally divided into four periods - Early Cholas, The interregnum, Medieval Cholas, Later Cholas. The rivers Kaveri and Ponni had very important place in their dynasty. Adiperukku festival was celebrated each year during the floods of rivers. Kaveripoompattinam and Nagappattinam were two famous ports. They were the center of trade and commerce. For better ruling, the empire was divided into several provinces called Mandalams. They were also subdivided into Valanadus. Valanadus were further divided into Kottams. Kottams consists number of villages. Different authorities - ur, nadu, sabha, nagaram were there to collect tax and to maintain the accounts. They had a strong military. The army included war elephants, cavalry, navy. Elephants were used heavily in the land battles. They also had a very strong navy. It was one of the strongest navy of Asia at that time. Navy helped in the conquest of the Ceylon, Srivijaya. Agriculture was the main profession of the people of Chola Dynasty. Silk Weaving was also a respectable job. Kanchipuram became a center of silk Weaving. Silk was exported in large quantity. Beside silk, Wootz steel, spices were also exported. They had a very high reputation in foreign trade. China and south-east Asia were the main foreign trade location. There were different guilds, community and caste in the chola period. Some of them are- Vellalar community (Courtiers, army officials), Ulavar community (associated with agriculture), Kaikolar community (Merchants, Weavers ). For agriculture, many canals and large water tanks were created - Uyyakondan canal, Rajendran vaykkal, Sembian Mahadegvi vaykkal. Solagangam tank was recognized as liquid pillar of victory. Chola Dynasty had enriched the Tamil literature, art and architecture like no other dynasties. The temples build during this dynasty are one of the finest art. The temple of Gangaikondacholisvaram and the Airavatesvara Temple at Darasuram were declared World Heritage Sites by the UNESCO. The sculptures and bronzes were also remarkable- Nataraja the Divine Dancer is one of the finest art. Tamil literature flourished greatly during this dynasty. Some of the masterpieces were- Ottakuttan's Kulothunga Cholan Ula, Kamban's Kambaramayanam, Jayamkondar's Kalingattuparani etc. Nannul a work on Tamil grammer during the Chola dynasty is still relevant. With the rise of Pandyan Dynasty the Chola dynasty started to decline and later it became the reason of its downfall.